Secretary of State Mike Pompeo speaks to members of the media after a closed door meeting with Senators about Saudi Arabia at the Capitol in Washington, Nov. 28, 2018. The U.S. Senate voted 63-37 Wednesday to move forward legislation seeking an end to U.S. involvement in the Saudi-led war in Yemen. The vote is mostly a signal to the administration because House Republican leaders have not indicated they will take up the measure. The vote was evidence of the widening gulf between the White House and U.S. lawmakers regarding Saudi Arabia, even after two top members of President Donald Trump's national security team provided a classified briefing to the full Senate. Nearly two months after a dissident Saudi journalist was killed at the kingdom's consulate in Turkey, Secretary of State Mike Pompeo and Defense Secretary Jim Mattis urged preservation of Washington's historically close ties to Riyadh, including U.S. support for the Saudi-led military campaign in Yemen. That message fell on increasingly deaf ears as senators of both parties blasted the exclusion of CIA Director Gina Haspel from the closed-door encounter. The CIA is widely reported to have concluded that Saudi Arabian Crown Prince Mohammed bin Salman ordered the slaying of Jamal Khashoggi, a U.S. resident. 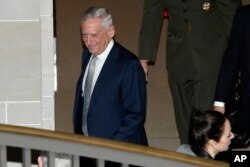 Defense Secretary Jim Mattis leaves a closed door meeting that he attended with Secretary of State Mike Pompeo and Senators about Saudi Arabia, Nov. 28, 2018, on Capitol Hill in Washington. "Not having Gina Haspel at this briefing is a cover-up," the top Democrat on the Senate Foreign Relations Committee, Bob Menendez of New Jersey, told reporters. "It tells me volumes about what really is going on here." "Look, he [Salman] is responsible for this death [of Khashoggi]," said Senate Foreign Relations Committee Chairman Bob Corker, a Tennessee Republican. "The fact that he hasn't come clean, the fact that we haven't forced him to come clean, is creating a problem. And Congress is likely to respond to this." FILE - Saudi Crown Prince Mohammed bin Salman attends the second day of the Future Investment Initiative conference, in Riyadh, Saudi Arabia. Pompeo said based on all the intelligence he has seen, there is no direct evidence linking the crown prince to Khashoggi's death. He also strongly objected to a pending Senate resolution to halt American backing for Saudi Arabia's actions in Yemen, describing it as "poorly timed" and arguing it would scuttle efforts to end the country's devastating civil war. "Passing a resolution at this point undermines that [peace effort]. It would encourage the Houthis [Yemeni rebels]. It would encourage the Iranians," Pompeo said. In unclassified excerpts released from Pompeo's remarks to the Senate, the secretary of state argued that America's withdrawal from the Yemeni conflict would extend the civil war and make it more deadly. FILE - An image of slain Saudi journalist Jamal Khashoggi is set up before a memorial event in Washington, Nov. 2, 2018. Connecticut Democratic Senator Chris Murphy argued the reverse is true. "The fact of the matter is the Houthis don't believe the Americans are an honest broker," Murphy said. "So, by Congress showing that our support for the Saudis is not unconditional, it actually gives reason for the Houthis to come to the [negotiating] table." The senator added, "I don't think the administration won any votes [to oppose the Senate resolution] in that troubled briefing." Even so, some senators who opposed a previous version of the resolution earlier this year signaled they had not changed their minds. "I think the secretaries made a pretty convincing case that, as outrageous as the [Saudi] behavior is, it would be counterproductive to do that [end U.S. involvement in the Yemeni conflict]," Wisconsin Republican Ron Johnson said. "It's a mean, nasty, ugly world out there." 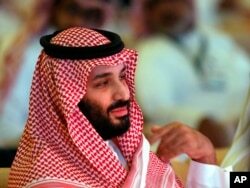 Saudi Arabia has denied allegations that Salman played a role in Khashoggi's death, blaming the killing on rogue agents. Trump has echoed Riyadh's denials and said the matter remains an open question. South Carolina Republican Senator Lindsey Graham, a frequent defender of Trump, joined other lawmakers in demanding a briefing by the CIA and threatened to withhold votes on urgent legislation if it doesn't occur. "If that briefing is not given soon, it's going to be hard for me to vote for any [federal] spending bill," Graham told reporters.